?utopia & chaos?at MINA-TO?Spiral 1F? Several works will be exhibited. We will inform you as follows. The accent of this show is set on Imagination, as the artists presented are depicting their personal and ideal vision of the world, their Utopia, through a Chaos of objects, characters and scapes extract from daily life, giving critics of the real world. Erika Kusumi will invest the space with her surrealistic digital collages, bringing together diverse views the artist has taken herself, to share the visions she has in dreams. Ayako Kuno will give shape to her vision of Tokyo cityscape as an organic entity through her metal carve d sculptures . The new works of Shunsuke François Nanjo, made for Spiral with thermochromique paint, wil l function as clues to unveil the mystery surrounding the entire series. 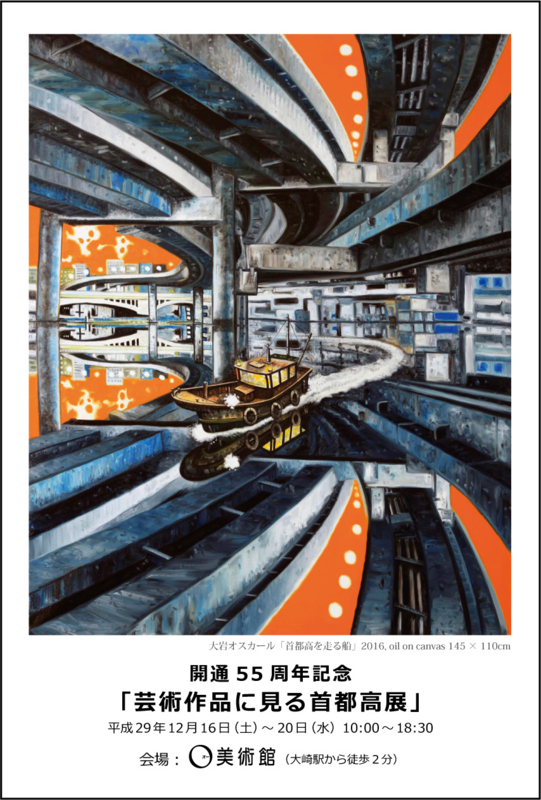 Finally, will be showcased the videos of Sumito Sakakibara, functioning as a cycle in which Utopia and Dystopia coexist in an atmosphere of Chaos. We invite you to visit, discover and purchase a piece of the universe of this 4 young and talented artist. spiral take art collection 2017 "????" at "Spiral Selectors Booth"Several works will be exhibited. *Closed on 19 December for a change of the exhibit. *It is possible to avail the shop page the artworks of Sato Haguri in this site. Sato Haguri produces wooden carvings where she fosters a sense of lightness, using combinations of tree structures to create sculptural space. A motif that appears within all these works is people. The color palettes and various compositions create a gently whimsical impression. Haguri was awarded the Toshiyuki Inoko Prize at Geisai #20 in 2014 and went on to receive the Tokyo Design Week Asia Awards Art division Semi Grand Prix in 2015, and another prize in the Three-Dimensional Moving Image division at Tokyo Wonder Wall in 2016. Hear the sound of the air as it hits the back of your nose. In their mind and body alike. Emiko Makino is drawn to the unique qualities of humans and animals. Depending on how they are viewed, they can appear quite similar or entirely different – It all comes down to the particular moment, gesture, or body part. Selecting materials such as FRP, metal, or felting to create the right textures, her camphor wood sculptures bring together the shared and unique forms of living creatures combined into single entities. image: "Mirror matching” 2017 Camphor tree,FRP,metal 27×26×23? Saturday 30th September :We will be open until 22:00 for Roppongi Art Night. Opening Reception :Friday 29th September from 18:00 onward. Closed:We will be open every day throughout the exhibition. Artist Hikaru Myoen can seen to have the approach of a fickle child at times, for he has a fierce ability to concentrate all of his energies on a specific motif when it takes his fancy, but before long his attention tends to jump to something completely new. What makes him different from an actual child, however, is that when he puts his mind to something, he has the technical skills and physical ability to realize it. It seems that for Myoen, it is the difficulty of the challenge that is key, for when something is no longer hard it is no longer interesting. Last year he began painting in an abstract style, having spent two solid years prior to that depicting rubber ducks. As of this spring, it appears that penguins have already become his new focus. You may think that Myoen has simply switched from floating ducks to another species of flightless bird, while in reality a big shift has occurred, expressing itself in the form of a highly tangible soft yellow glow that appears around the heads of these animals. Myoen achieves the effect by first spray painting on the blank canvas. The form of the penguins then emerges through the subsequent layering of pre-determined black shapes, the order of this painting process creating the impression that the animals are backlit. Spray paint is a new medium for Myoen, who embraces the risk of the paint spattering in unexpected areas due to clogging or the like. This method whereby you cannot completely control the shape or position of the paint creates a tenser atmosphere during production and requires far more tolerance of chance than when painting with a brush only. When artists are able to make good use of such mental states, the potential of their artistic expression can greatly expand. According to Greek mythology, gods who fell to earth would be surrounded by a nimbus, that is, a shining cloud. Later, the word “nimbus” took on the meaning of “aura,” or an “endearing atmosphere.” The ducks the artist previously depicted as his subjects were anonymous industrial products created for human beings, but in his new works each of the penguins has its own personality, and it seems that at times Myoen is forced to sympathize with these traits. It can be said that it is here that his interest shifts from an artificially controlled situation to a more realistic world. If you think in terms of the birds’ habitats, it would be like the difference between a bathroom or pool and a harsh ocean. Not to worry though, his penguins have a nimbus. in ART ASIA FUKUOKA 2017 in September. Mami Itagaki, a graduate of the Tokyo University of Arts Sculpture Department who has exhibited her work in both solo exhibitions and international art fairs, presents sculptures made with toso, a clay created from glue-mixed paulownia wood powder. Dealing with the blurred nature of imagination and reality, these sculptures taking the forms of high school girls strike new Buddhist statue poses. image:"Flower of water" toso, pastel H 62×W25×D28? Kohei Fukushima was born in Tokyo in 1980 and graduated from Yokohama College of Art and Design. His works integrate various media in explorations of contemporary art photography. In recent years he has focused on themes of “visualizing things not readily apparent to the eye,” “the processes of nature pilgrimages,” and “death.” Mounted on hanging scrolls, folding screens, and other forms that simultaneous emphasize connectivity and disconnectedness, his works grapple with transcendental ideas such as life, death, god, and nature. In 2017, Fukushima has been chosen as a finalist in the 20th Taro Okamoto Award for Contemporary Art and the 6th Tobi Selection competitions, and received the Yokohama College of Art and Design Dean’s Award for Excellence. Map apps have already been around for more than a decade, and they our expanding the realities of our daily lives. My works capture the “noise” produced when computers read map application data recording the events and changes of our everyday surroundings. I use this data to create scenes that go beyond what we see in the media, reflecting a hyper-realistic view of the world. image:?map? 2014 pigment print 100×150? Ayako Kuno assembles her sculptures from small parts of silver, brass, and other metals formed using lost-wax casting techniques. Her work lets us consider the city we live in from a variety of perspectives. In recent years Kuno has received prizes in competitions for young artists and is acclaimed for the high degree of skill in her intricate creations. ?You can buy the artworks of Shitsu Murayama on this shop page. A painting that tries to express the form of a person using straight-line strokes on a colored surface. Children's faces are often used as a subject because they are round, personally I feel that the circularity is really compatible with straight lines. People are a central motif which are continually used. I am interested in the attraction of the way they're formed as a three dimensional shape and the way that meaning always comes up from that gesture. I am drawn towards exploring the intersection of the two. The production process is basically clarifying the shape of the tone with shading as a clue. This is a simple and orthodox method in itself, but on the other hand, in the balance that tries to make the planar decorativeness of the painting parallel, the color and tone of the image are decided. The theme of this picture is "Kids Know" or in other words, kids know everything, as it follows two children's own facial expressions and motions, and also the theme of the world seen from a sort of critical viewpoint. image:[Glass] oil on canvas 60.6×50.0? Masayasu Tokoro / Dolls3? ?A Place of Thought? image: amateur 2017 mixed media 36×20×16? Kensuke Miyazaki went to London to begin producing art after graduating from University of Tsukuba, School of Art and Design. Working under the concept “Super Happy,” Miyazaki produces “paintings to make you happy.” In 2006 he established a mural painting project at the Kibera Slum School in Kenya, a slum township where it is said that approximately one million people live. This wall mural, which has been produced together with the local community, has a unique aesthetic style that has drawn attention far and wide. Miyazaki is currently busy with “Over The Wall” activities, where he creates mural paintings around the world. In 2016, he painted murals at the National Hospital in East Timor, and in 2017, with the cooperation of UNHCR, he will produce mural paintings for domestic refugees in the city of Mariupol, Ukraine. Miyazaki is an artist that brightens up the world with paintings. image:"masai balloon"2016 Acrylic on canvas,53×53? Haruhi Inaba’s eerie, childlike dolls delicately express the beauty of frail, ephemeral life. If we cannot change the cycle of strains that emerge instantaneously in daily life, creating divides amid the constant changes of our days in a circle with no beginning and no end, then at least we can communicate in moments of the present, greeting each other with “Good Morning,” “Good Night,” “Let’s Eat,” and “Goodbye.” These single moments add up to an eternity where we can live without fear of change. There is no greater happiness than saying these words and sharing these moments. image:?Cast-off skin of jewelry? panel:25 x 25 x 4cm doll:18×7×3? People cannot define the “self” alone: Their faces emerge from exchanges with other entities. Just as words and actions change as times, places, and circumstances do, people are not one dimensional – they contain diverse aspects that can sometimes seem contradictory. Wataru Miyagacho applies mineral pigment paints to human figurines made of wood. The expressions of these characters are revealed in the fine particles of the paint and in the contours of their bases, as if they were answers changing with the question, or courses of actions varying by environment and position. Like a constantly fluctuating temperature, the self is not certain, yet this temperature is surely a testament to one’s existence. The artist presents his “samples” of these dynamic temperatures possessed by each of us. This exhibition’s title, “Tomorrow’s Bread,” refers to breakfast, a familiar daily scene that is also connected with life and the near future, a bright new day. There is a clichéd phrase about the sun rising on everyone, but of course those in the springs and those in the autumns of their lives have a different number of mornings left to greet. The ability to make fun of the idea that breakfast is a kind of sacred ritual is the privilege of those too young realize its true meaning. The high schooler here must be such a youngster, dashing through the halls munching on a piece of bread, perhaps running into a transfer student as she rounds the corner. Put your hand on your heart. On the mornings of your adolescence, what did you desired? Surely not bread. Only those capable of such reflection and of finding the hook will realize the answer to the opening question. Hikaru Myoen is well known for his rubber duck series. I was constantly met by these creators at every exhibition of his, and I thought to myself, “Could he not someday wave these yellow ducks into the blue sky and move on?” Then this artist decided to take a distance from his signature motif of ducks, and at the same time move away from the long practiced techniques of oil painting and figurative depiction and began to investigate a new approach of chance and ambivalence. In this solo exhibition he presents water color works based on the theme “colorful”, as well as open air installation. He also provides a workshop for children and presents the color of sound at the opening. While it might be a little sad that we are no longer to encounter the cute duck characters which defined Myoen’s career we are certainly to be met with a space of happiness which reveals a transformation in the artist. image:Colors 2016 watercolor on paper,24×31? Opening Hours : 12:00-1900 | Closed : Mondays?12th,19th September closed. Copen Nana explores perception through the act of painting. Although we are used to seeing a rectangular frame of sight (the painting, the photograph, the computer screen) our actual visual awareness does not always fit to the quadrangle. Depending upon what enters our perceptual field the shape of this territory may morph into other shapes. In her work the artist attempts to plot this field in all its distortions through the very outline of the canvas and so map through color sound, heat, gravity, air, rhythm, wind and scent, and all other non-visual perceptions. These uninhibited colors seem to leap from the surface in a musical action upon the canvas support. In this way they form a musical score of perception for the viewer to play from. Making each “fragment” one by one, Kai Goto’s works combine to symbolize the ever-changing transitions of people and things through division and reintegration. Artist’s statement: I wonder if dead butterflies could fly again? Their wings draped in memories of life, perhaps with sound they could dance freely through the air. For my first solo show in Tokyo in two years, I have arranged a sound installation with the help of musicians, composing piano music from algorithmic compositions based on field recordings of living environments with butterflies. On the musical scores I have arranged several butterflies and their wings. I am realizing a day dream in which life and death mingle together. Taking the unique approaches of needle felting and toso doll-making to give her works form and Nihonga painting materials to give them color, Akatin creates sculptures that leave deep impressions on viewers. image:?If I were a chunky gold fish...? Sato Haguri, winner of the 2014 Toshiyuki Inoko Award at Geisai #20 and Tokyo Design Week 2015’s Asia Awards Art Division Semi-Grand Prix, presents parquet wooden sculptures of female characters with a floating lightness in their colors and poses. Haguri states: The act of carving human figures from wood is a theme throughout my work. It started with a strange pleasure in bringing sculptures resembling myself into existence, but then I found that parquet wood mosaic techniques bring space into solid blocks of wood, giving them a “lightness” that translates paradoxically to a lofty feeling. I oscillate between these two elements in carving. For this exhibition, I’ve added figures that express certain onomatopoeic expressions such as “gritty,” “spikey,” and “snakey.” I hope visitors will give these girls their own stories when they see them. Metal work artist Ayako Kuno first set out in her career in 2014 and in a short space of time has gained wide recognition, as proved by a string of awards and praising review. In this exhibition she sets out on a more sculptural adventure in her chosen medium. Examining the condition of bed-wetting Ryosuke Kawahira utilizes briefs as a canvas upon which he renders the images drawn from his childhood dreams. Executing his forms in brightly colored, pop-like expressions he here also unveils a section of his animation work too. The artist Tartaros Japan has reshaped art and symbolism with the original character “Satan Bouya.” Designed with elements of manga-esque caricature and physical distortion while incorporating icons of Eastern and Western art, these works tackle themes including love, belief, civilization, and rock. The contemporary idol Satan Bouya references physical distortion in Japanese anime as well as icons of ancient civilizations. The inspiration for his devilish design comes from admiration for horned gods that vanished in the dramatic changes of civilizations since B.C.E., and this long view of anthropology has significance in observing the contemporary world. Satan Bouya’s absence of a mouth denotes the spiritual world, where there is no breathing, eating, or speaking. His black lacquer body conjures up images of darkness, outer space, and oil, with its connotations of the earth and contemporary society. We citizens of the modern world may find alternative perspectives in these new sculptures blending symbols of East and West. Date: Feb. 20 (Sat.) ,Door open at 16:00,curtain 17:00? There was a time when artist Motoki Tanaka could think of a person’s face simply as a form of personal I.D. If people had no faces, how would they leave impressions on? In these works, Tanaka creates discernible impressions in faceless characters by drawing out their clothing as elements of their personalities. Kota Nishiura portrays the individuality of animals through their expressions in works of clay stretched over wood panels with his fingers. This original technique creates detailed lines diligently shaped into layers, forming images with emotional resonance left open to interpretation. We want to know what animals are thinking. People, who rely on the behaviors and actions of animals, try to read into their emotions and sentiments. Fusing fish, insects, birds and a wide variety of living things, Yuki Tsuboshima gives birth to strange new life forms which in fact have the ability to move and take numerous shapes. Whilst working primarily in metal work, on this occasion he also incorporates the parts designed with a 3D printer and in this approach combines traditional craft with contemporary art and technology. We exhibit the oil painting a duck which gets on to Christmas wreath and the duck for 5.2 meters in width, the monochrome photography of the duck.Aiso we install the Christmas tree of 3.6 meters in total length that decorated with several hundred art objects of the duck which put an electric bulb and was able to make shine. Hailing from Hokkaido, Hikaru Myoen is an artist who creates colorful, pop-like oil paintings based on the motif of toy ducks. Mayu Shiomi mainly makes sculptures, paintings and drawings.Her motifs are existing anime characters and ready-made products.Things around us in our everyday life are considered as second nature for us.Recently, she has presented sculptures using aluminium foil which is a familiar material.She curled up and crumpled them. She treats them like clay.Her shiny silver sculptures are sometimes very large and sometimes very tiny which give us a strange feeling.She expresses such works as "Beauty and Wilfulness of the World" and " The Joy of being alive and The surprise to come". left side?Silvery Harty 2015 aluminum foil? Shitsu Murayama attempts to generate 3D forms through the combination of light and dark. His series of portraits, which recall the effect of rigid mosaics, first developed from a sketch of a baby in a pram he came across in Ueno park, and has since become a central theme of his work. His hand painted works which divert from the invocation of digital tools are while seemingly systematic, in actual fact vastly fluid, with the abundance of colored planes which build up a sculptural form. The familiar features of eyes, nose and mouth connect with the history and background of an individual, while the colored surfaces of abstraction come together in a process which finally signifies the “face”. Whilst taking up the motif of a child’s momentary expression, Murayama lends his distinct style to translation of an individual’s very warmth. Image:baby face 2014 oil paint on canvas.91×91? Ayako Hisano takes on a wider, deeper and more diverse perspective of the urban built environment which appears to possess its own life force as a living organism. Here Hisano snatches upon elements of this eclectic entity and renders them in silver and gold, embodying Tokyo in this exhibition through the invisible lines of its borders. Bedecked in splendor, these goldfish are absorbed in a competition of beauty. Their ornamentation is like a magic that transforms them easily into their ideal selves. If they wish for this magic to last forever, they are imprisoned in an eternally superficial world of mirrors. We must all be careful not to be caught in this mirror world. These framed paintings of flowery goldfish are from a series continued since 2008, in which artificially bred prize goldfish resemble over-dressed and made-up women. The finely detailed yet imposing scales of the fish present powerful color contrasts. Focusing on these works, this exhibition reveals the ability of Rika Shimasaki’s paintings to entrance the viewer. The dolls of Haruhi Inaba express the fragile fleeting beauty of life, and the double-take we are faced with in the gaps born from the contortions of the everyday, just as one might be taken aback to realize that a tissue fallen on the floor is in fact a cabbage white butterfly still warm from life yet filling with the smell of death. Masayasu Tokoro creates jointed dolls with movable bodies, which he calls “armature dolls.” He designs their clothes himself using dyed fabrics. Displayed in standing position, the presence of these figures is richly expressive. The protagonists of this exhibition’s story are unidentified masked men. They do not take center stage in their minor roles as bad guys, but spend their day-to-day lives laughing and crying with their cohorts. Just like everyone else, they are waiting for the bitter winter to give way to a warm spring. The artist Kenichi Obana tells their tales in carved wood and oil paint. Kai Goto’s “fragment” series started with an interest in the cracks that form randomly in oil paintings. These cracks break off into pieces of paint, giving Goto the idea of collecting and reconstructing them. She grew absorbed in creating more and more of these fragments with a pencil, beginning to see transformations resembling dividing cells, crystallizing minerals, even people and things. Soon she found herself the captivated prisoner of these shapes. At this exhibition, the third of her “fragment” series, Goto goes beyond so-called “broken pieces,” presenting specimens of butterflies and shards of colored paint as they are. In these works Goto portrays the cyclical physical processes birth, decline, bacterial and fungal decay, and the re-budding of life. Inspired by the stunning Japanese art of kintsugi (repairing chipped ceramics with lacquer and precious metal powder), Hitomi Onuki assembles separately created glass parts into works evoking the beauty of the strangely formed. At this exhibition, Onuki expresses her thoughts on the idea of “boundaries” in these fragile glass wolves enshrined in their worlds of mirrors. Kohei Fukushima’s landscape photography expresses “the forms of nature and nature as it is.” Incorporating elements of Japanese culture,the works at this exhibition are spatial portrayals of landscapes. “Kegon Waterfall” consists of an enlarged photograph divided into three sections,with left and right sides protruding outwards. This finely detailed triptych captures the wildness of nature precisely while drawing the viewer into its reconstructed space. Becoming an element of the work, the viewer is awakened to the innate power within the image. Artist Yohei Kichiraku came across an ornithological guide at a flea market one day. Noticing that illustrations of some of the birds had been cut out by the previous owner, their strange absences gave him the idea of “returning” the remaining birds to nature. Kichiraku has photographed drawings from the book he placed in forests and tree branches, faithfully replicating the guide’s vantage point of using nature as a stage. In addition to these witty and intelligent photographs, pictures taken of the book itself as the jumping-off point of birding expeditions are also a crucial element of the series. In these works, Kichiraku lets us vicariously experience the mystery he first felt by the birds’ absences. The “Birds” series goes beyond photography of deep forests, inviting us to an even richer place that condenses the joy of photography. Mayu Shiomi reconstructs the images of characters everyone knows, using their physical traits, everyday items, and backgrounds as motifs in her art. Her unconventional and romantic sculptures, paintings, drawings, and other works reexamine the definition of beauty. This exhibition presents some ten works of various media including sculpture, painting, drawing, and video that incorporate preexisting characters and protagonists in stories, linking them to real society. Titled “Adult Picture Book”, this show displays doubts about the values of adults while simultaneously offering an exciting view of the world held by children. Through a variety of artistic expressions, visitors experience a unique and evocative world. The Naraku Playground is a place from another time, where mythical beasts emerge from the far corners of the Naraku Kingdom. When these creatures come out to play, the invisible can be seen, the inaudible can be heard, and unspeakable words can form. The mythical beasts of these works are inspired by classical mythology and the traditions of manga, animation, and character design. The artist’s envy of both antiquity and the future are deeply engraved in them. The amphibian-like main figure, “SatanBouya”, is a distortion of the spirits of ancient Persia and manga characters. Lacking a mouth, it fits with the Naraku Playground’s theme of seeing the invisible, hearing the inaudible, and forming unspeakable words. These installations combining music with painting and sculpture allow visitors to see, hear, feel, and enjoy TataorsJapan’s “Naraku Playground” in a traditional Japanese garden designed for strolling. The artist hopes visitors will experience another world where these mythical beasts fly, howl, and run rampant. We want to know what animals are thinking. People, who rely on the behaviors and actions of animals, try to read into their emotions and sentiments. These interpretations may largely be correct, but it is also possible that animals possess more complex and subtle thoughts than we image. Just like humans, even animals within the same species are individuals with different personalities. If only we could one day communicate with them through words. The “My name is” series explores the individuality of animals in exactingly made works of kneaded eraser applied to styrofoam. In today’s society one must become mechanical, event to the point that individual feelings are squelched. We tend to judge people according to our images or impressions of them in times when they are behaving in this mechanical way. In instances when individual emotions emerge contrary to our impressions, we feel a sense of surprise, and at the same time sympathy. These moments when we encounter glimpses of such faintly apparent emotions, or when we experience them ourselves, are of extreme interest to us. Whether we observe these moments or experience them ourselves, they remind us of the overreactions we’ve seen on TV dramas or in manga. These works make use of the angles and societal symbols that make us feel the greatest sense urgency. In a society of true feelings and public appearances, emotions that unexpectedly bubble up let us participate in moments of shared interest in the scenes unfolding before our eyes. These works aim to capture in single panels the quiet laughter lying beneath the surface of society. Hikaru Myoen is from Hokkaido. He creates colorful pop paintings featuring enlarged and cropped images of toy ducks. This solo exhibition presents around ten new oil paintings, including wall-spanning 2x4-meter works, as well as a festive pool filled with rubber duckies. Small children are welcome. The blank space of the heart. It’s a place just slightly removed from the crashing and receding waves of tempestuous emotion. It’s a time to quietly reflect on oneself as if viewing the ocean from a far-off distance, if only to pull away from the waves of feeling temporarily. What if the figurines on display could call us to this place? At their core, these “amateur” dolls are made for stop-motion animation, their frames constructed with movable brass ball joints. Their heads, hands, and legs are built of wood and their clothes are original designs of dyed and sewn fabric. They strike a greater variety of poses than amateurs, wanting us to feel the richness of their expressions even in standing position. Unidentified masked men. More bad guys than heroes, they are minor characters who don’t have much to do with the bigger story. Still, they each go about their daily lives in matter-of-fact ways. They are not necessarily headed for despair. As individuals they live through every day with the belief that one day a bright morning will come. No matter how deep the darkness, dawn always breaks. Like rays of light shining on their lives, these acrylic paintings and wooden statues express the untold sorrows and stories of these characters.